Have you ever been desperate to find a gallon of soy sauce? I know I have. Well there is no need to fret my friends… Barrio China, that’s China town to you and me, is here to help, with not one but several stores providing a plethora of soy sauce in all varieties and sizes. No seriously, China town, in a small corner of the Belgrano neighborhood, does provide some of the few shops in the city where things like hot sauce, tofu, black beans, and Dijon mustard can be purchased. Argentine food is good, but flavor and spice are not exactly over abundant and local grocery stores leave much to be desired. 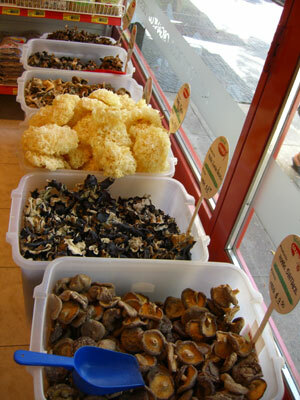 The shops in China town are exactly what the desperate gourmet needs, sauces, spices, rice noodles, sesame cookies, shitake mushrooms and oolong tea, need I say more. You can even buy shrimp crackers and inexpensive smoked salmon sushi roles from a shop appropriately named “Casa China.” And the list of curious and intriguing treats continues. If you aren’t much for cooking then there are a plethora of Chinese restaurants ready to do the work for you. Most serve up standard Chinese dishes, the average dish costing between 10 and 20 pesos, but expect to pay closer to 40 for a seafood specialty. There are also lots of vegetarian options with tofu galore to please all the omnivores who struggle everyday with Argentine cuisine. 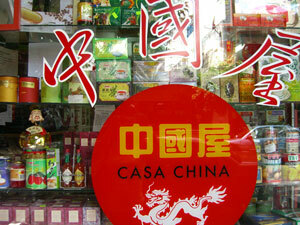 Check out Cantina Chinatown on the corner of Mendoza and Juramento for some amazingly sweet ice tea. For the culinary adventuresome, there is even a Chinese style parilla, with roast ducks and various unidentifiable meets and even chicken feet, yum!!! Chinatown starts at the intersection of Arribenos and Juramento and runs for a few blocks down Arribenos. It is very close to both the train line and a bus depot where over a dozen city buses stop at, look for bus lines marked B. Belgrano. There is also the Subte stop Juramento on the D line, a faster alternative to the buses though it drops you a few blocks further away. And if you are searching for Chinese knick-knacks, paper fans and lanterns, cheap change purses or carved jade statues of Buddha then look no further. 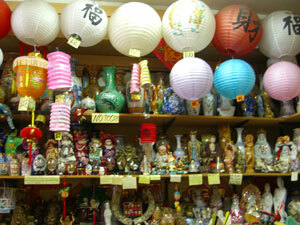 As with any international China town, several shops overflowing with mass-produced trinkets can be found nestled between the specialty grocery stores and Chinese restaurants. Subway stop: Juramento on D line. Chinatown is about 5 blocks long, but it’s pretty good and a lot cleaner than the one in New York. We ate very well at one restaurant called Lai Lai. A decent selection of vegetarian dishes with tofu, and the beef dishes are good because they use argentine beef. We were ready for a break from steak, steak, empanadas, and steak. It’s not a top end restaurant with a scene. It’s good Chinese food and quite inexpensive. Probably good with a family. It’s at Arribeños 2168, in Belgrano. This page rendered in 0.46 seconds.